This is the first game in the Ghosts 'n Goblins series. 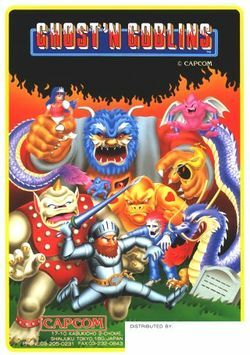 For other games in the series see the Ghosts 'n Goblins category. Ghost 'n Goblins is a platform arcade game by Capcom in 1985. Known in Japan as Makai-Mura (lit. "Demon World Village"), it is commonly regarded as one of the most difficult video games to complete that has ever been made. Those who are skillful enough to reach and defeat the final boss the first time through are not treated to the ending of the game. Instead, they are sent back to the beginning of the game where they must fight through every stage all over again at a higher level of difficulty. Only upon beating the game for the second time does the player get to see a (short) happy ending. In the game, the player controls a knight named Arthur, who must defeat zombies, demons and other undead creatures in order to rescue a princess. Along the way the player can pick up new weapons, bonuses and extra suits of armor that can help in this task. Incredibly strong and persistent enemies make it nearly impossible to make it through a level unscathed, although one can do so with enough practice. When Arthur is first struck, his armor falls to pieces, leaving him far more vulnerable and exposed in nothing more than his boxers. The game does have a two-player feature, but in this mode play simply alternates between the two players. Ghost 'n Goblins is one of the few games in which one of the enemies, the Red Arremer, has spun-off and become nearly as popular as the protagonist of the original series. The original game was ported to numerous home computer platforms, as well as a particular popular conversion for the NES. It is followed by three official sequels: Ghouls 'n Ghosts, Super Ghouls 'n Ghosts, Ultimate Ghosts 'n Goblins and several spinoffs including Gargoyle's Quest, Maximo and Makaimura for WonderSwan. It was remade in 1998 for the PlayStation and Sega Saturn as part of Capcom Generation 2. It was later repackaged in 2005 for the PlayStation 2 and Xbox as part of the Capcom Classics Collection. The NES version was remade and released outside of Japan for the Game Boy Color in 2000. The NES version was also remade and release for the Game Boy Advance as part of the Famicom Mini collection. And the NES version was released as part of the Wii Virtual Console in 2007. One storm filled evening, Arthur and his love, Princess Prin Prin were enjoying a quite night in the cemetery together, when they were beset upon by a winged Satan. The Satan dove and captured the princess, and disappeared with her before Arthur's eyes. Without a moment's hesitation, Arthur donned his knight armor and picked up his lance, and set forth to Astaroth's castle where he knew he would find his abducted love. This page was last edited on 15 April 2016, at 15:42. This page has been accessed 72,258 times.